The PetSafe® Microchip Cat Flap has been designed to allow your cat easy access to the outside world whilst keeping other troublesome cats and animals out of your house. 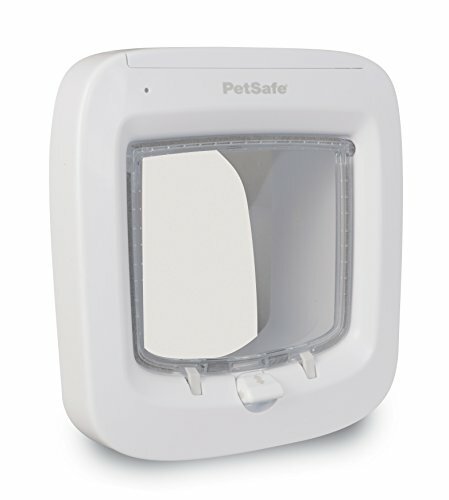 The PetSafe® Microchip Cat Flap works by reading your cat's unique microchip ID without the need for a collar or accessory. Features • Easy to program • Can be programmed for up to 40 micro-chipped cats • Helps restrict entry of unwanted cats • Reinforced, dual auto-latch with 4-way manual lock • Low battery indicator • Draught Excluder • Quick Start Guide and Cutting Template Fitting Options: • Fits wooden doors • Fits PVC / UPVC & Metal doors • Fits brick walls • Fits windows & glass doors, single & double glazed Suitable for cats up to 8 kg. Dimensions Overall Size: 232mm x 232mm Cutout Size: 175mm x 168mm Glass Cut Out Size: 212mm diameter* Tunnel Depth: 72mm Max Pet Shoulder Width: 150mm Maximum Pet Weight: 8kg This cat flap is compatible with FDX-B (15 Digit) Microchips *It is not possible to cut holes in toughened glass or double glazed units except at the time of manufacture. Please contact a glazier.